The Lunar Orbiter Image Recovery Project (LOIRP) has released another iconic image taken during the Lunar Orbiter program in the 1960’s. 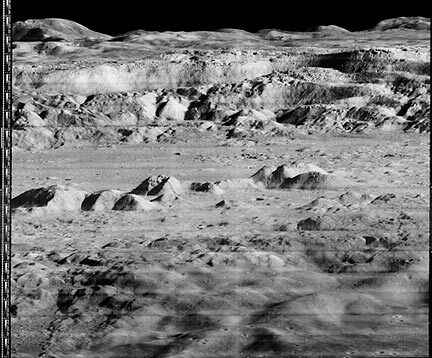 This image, which shows the dramatic landscape within the crater Copernicus was often referred to as the “picture of the century” by many people at the time of its original public release in 1966. This image was taken by the Lunar Orbiter 2 spacecraft at 7:05 p.m. EST on 24 November 1966 from an altitude of 28.4 miles above the lunar surface, 150 miles due south of Copernicus. At the time this image was originally released most views of the lunar surface involved looking straight down. Little, if any, sense of the true elevation of lunar surface features was usually available. This photo changed that perception by showing the Moon to be a world with tremendous topography – some of it Earth-like, much of it decidedly un-earth-like. The following image is an interim version, with reprocessing and enhancements being made constantly. A larger, raw version (2.2 GB in size) is now online at NASA’s Lunar Science Institute. Larger view. 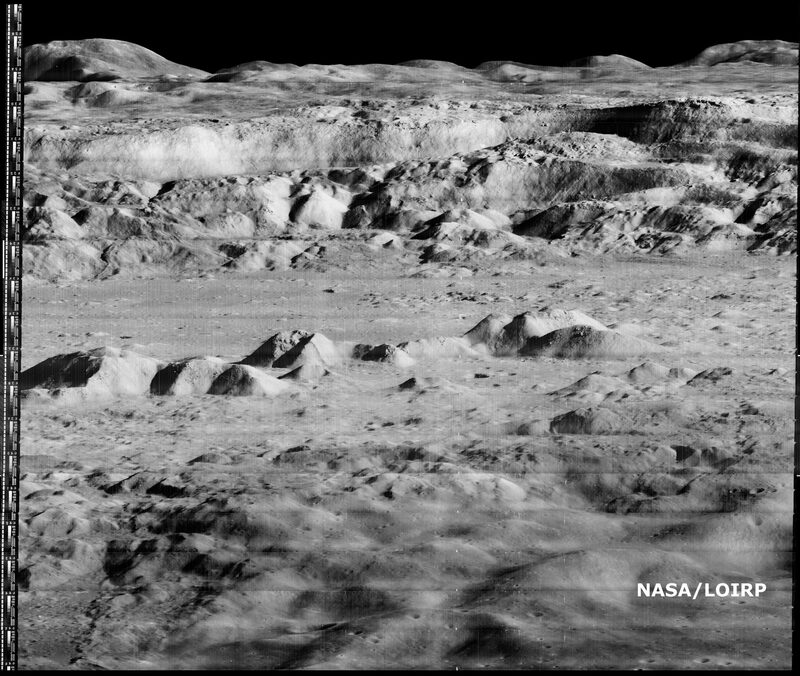 If you compare this new image with LPI’s high res version you can clearly see that this new image shows multiple striations in the surface, small boulders, landslides, shadows and a myriad of fine details simply not visible in the original. The LOIRP currently estimates that the resolution of this image is less than 1 meter/pixel. Larger view. The LOIRP, funded by NASA’s Exploration Mission Systems Directorate and NASA’s Innovative Partnership’s Program, with support from Odyssey Moon, Skycorp Inc., SpaceRef Interactive Inc., ACES, and the NASA Lunar Science Institute, is housed at NASA Ames Research Center at Moffet Field, CA. This project has utilized original analog data tapes and restored tape drives to digitize original Lunar Orbiter project imagery. Utilizing computer technology unavailable at the time the images were originally taken, LOIRP has been able to produce images which greatly exceed the resolution of the images as they were first seen in 1966 and 1967. The first image released by the LOIRP, the famous “earthrise image”, was made public in November 2008. It is anticipated with the release of this latest image of Copernicus, and further restoration of the original 40 year old hardware, that the pace of additional image releases will now increase. Dennis Wingo and Keith Cowing at the LOIRP have been working to understand exactly what Lunar Orbiter 1 saw as it looked back at Earth on 23 August 1966. When LOIRP released its first retrieved image last year they included some attempts to correlate the Earth with rough boundries. In so doing they discovered that the time estimated back in 1966 was off by an hour or so. 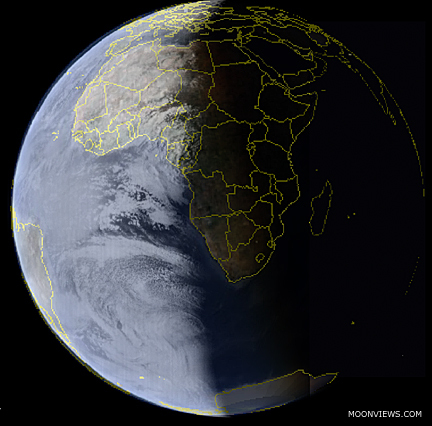 Dennis has now taken another stab at trying to understand what we all saw when Lunar Orbiter took this portrait of Earth. Click on image to enlarge. Image copyright 2009 LOIRP. Permission required for republication. LOIRP Invited to Present at 2009 Santa Cruz Film Festival. I am proud to announce that the LOIRP Image recovery project will be presenting a 3 minute video at the 2009 Santa Cruz Film Festival. This is a major northern California cultural event and probably the first time in 20 years that a space themed entry has been invited to present. This film festival is attended by thousands and the attendees represent the top tier of the cultural elite of the San Francisco and northern California, including the regents of the University of California system, political, and business leaders. Our presentation will be themed “In Praise of Old Men”, which will be a 3 minute video, beginning with the original Lunar Orbiter program in the 1960’s and segueing to our image and video record of bringing the marvels of 1960’s technology back to life with a focus on the retirees who have been instrumental in our efforts. It is a praise of this incredibly competent generation that took us to the Moon, and who even in their golden years, are an inspiration to the younger generation in their abilities. The video will end with some of the marvelous pictures of the Moon that we are getting now, and ending with an incredible image of the black and white Earth, lonely in the backdrop of space, derived from Lunar Orbiter I and V images. At the end we will auction off three high resolution prints as part of a Charity event at the festival and our intrepid Center Director, Dr. Pete Worden will participate with the head of the film festival in the auction. This will be a great way to bring the 60’s, the role of NASA in the popular culture of the era, and to honor the people who helped to make that a reality.